Home » Monthly Sales » September Sales on Radiators & Covers, Bathroom Fixtures, Orange-Tag Tile, Granite, & Paint! September Sales on Radiators & Covers, Bathroom Fixtures, Orange-Tag Tile, Granite, & Paint! Sale does not include select specialty items, items with missing or damaged price tags, or items from our consignment partners. Take 30% off the orange and blue tags on toilets, bidets, urinals, bathroom sinks, vanities, and bath tubs (including enameled, cast iron, & clawfoot tubs!). Sale does NOT include medicine cabinets, towel bars, and other bathroom accessories and decor. Sale does not include select specialty items, items with missing or damaged price tags, or items from our consignment partners. Sale does not include items with blue tags, items from our consignment partners, select specialty items, or items with missing or damaged tags. Take 20% off the regular price on granite counter pieces. Sale does not include laminate, corian, or other types of counters. Sale does not include stone tile, vanity sets, select specialty items, or items from our consignment partners. Sale does not include items with missing or damaged price tags, select specialty items, or items from our consignment partners. 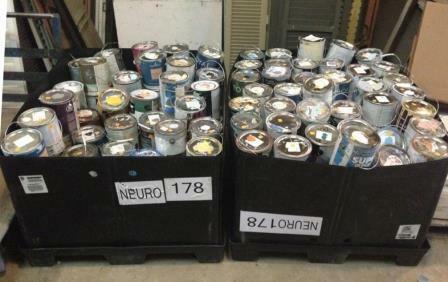 Please ask for assistance if needed – do not open cans of paint yourself!